What is Rural Bank of Mabalacat? 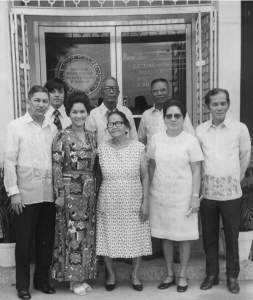 The Rural Bank of Mabalacat, Inc. started its operations in the town of Mabalacat, Province of Pampanga, on November 4, 1964, established by its founders, namely: Concepcion de Leon, Jaime Gomez (+), Lourdes Dycaico (+), Benedicto Tiglao (+), Angelo Hizon (+). The bank opened its extension office in Dau, Mabalacat on December 8, 1972. However, lahar threats in 1991-1992 from Mount Pinatubo’s eruption prompted the bank to transfer its main office from the Poblacion of Mabalacat to Dau. The adverse effects of Mt. Pinatubo and the closure of Clark Air Base did not deter RB Mabalacat from expanding its branch network, albeit slowly, by opening its Magalang Branch in August 1993, its Sindalan Branch in San Fernando, Pampanga in November 1997, Bamban Tarlac Branch in November 2002 and another full service branch in Angeles City in 2009. RBMI’s prudent and conservative hands-on management has allowed it to enjoy continued growth and stability despite the prolonged effects of the Asian Economic Crisis, the various problems that have plagued the country’s financial and political system, and the latest global financial meltdowns in the United States and Europe. We envision to deliver efficient banking and financial services to small and medium enterprises, while promoting countryside and agricultural development. To promote countryside development by means of our institution’s personalized products and services. To be able to contribute to individual growth, as well as to communities and groups.